English Teacher On The Loose: Playing Up! Acting Out! Bored? Hate English because it's an endless stream of exercises and learning vocabulary? I know kids who feel just like this, but it doesn't have to be this way! 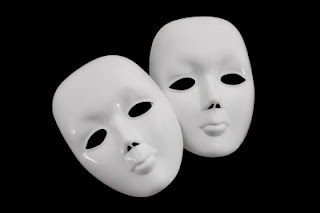 Drama is something which can make your learning come alive and you can use it with or without a teacher, in or out of class, and it will help you gets to grips with speaking the language. I remember that actually speaking, which when it comes down to is the reason most of us learn a second language, was the hardest part. I felt like I was lying, in some strange way. So make it fake. Invent a scenario and find the language for it. Just as you think through what you would say in a difficult situation in your own language, do the same in English. In the classroom, drama has the benefit of giving weaker students the opportunity to speak with confidence - they can rehearse their lines. Those who are (hyper) active can get up and move around. If the students write their own script then there's communication and writing involved. Giving and receiving instructions are also necessary, so many skills are put to good use! You can also use drama to introduce and discuss a theme. It doesn't have to be Shakespeare, far from it, just get an issue out there for discussion. Last week, one of my colleagues was absent and at short notice I had to teach her class. By mistake I'd left my emergency bag of tricks at home. Armed with no more than a CD from my car for inspiration (I had been listening to Monica Richard's 'A Good Thing'.) we had a very successful lesson on bullying. We discussed the problem: What makes people bully others? How do the victims feel? What should we do if we see someone being bullied? Then we assigned roles and wrote a script up on the board. If your class is big and your play is small split into groups and do the sketch a couple of times. Or if it's small, take it in turns reading different roles. Our basic idea was a bullying situation that was resolved with the intervention of a teacher (thus not fighting violence with violence). Also, that the bully realise the error of his/her ways. Scene 1: The bully in action. Scene 3: Teacher is called and punishment is given. Scene 4: Bully needs help with whatever it was he was bullying the victim for. Scene 5: Victim is the only person who can provide the help needed. Not only did the students speak English, but everone also had fun! Don't forget that Role Play is an integral part of most oral examinations (part 4 of the PTE General, all of the ECPE, part 3 of FCE and ECCE spring to mind) so dramatise everyday situations! See the Role Play Dialogues to the right of this post for more ideas! Don't play up - act it out!